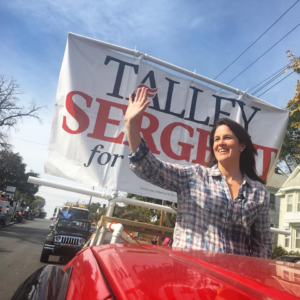 Talley Sergent, running to replace Rep. Alex Mooney in West Virginia’s second Congressional district, spent several days in the Eastern Panhandle this week, primarily focusing on the addiction epidemic. On Friday, Talley participated in a women’s peer recovery group meeting in Jefferson County, where she listened to women working to escape addiction. She also attended a meeting for local community leaders hosted by the Jefferson County Day Report Center on key issues related to the addiction epidemic. Friday afternoon, Talley visited with a local group that provides after school programs and support to boys and girls across Berkeley, Jefferson and Morgan counties. She also met with grassroots volunteers and interested citizens about her campaign, including an early morning coffee Meet & Greet, the Eastern Panhandle Young Democrats meeting and the Berkeley County Democratic Women’s meeting in Martinsburg. She finished off her visit by attending the Martinsburg vs Jefferson High School football game, and participated in the Mountain State Apple Harvest Festival. If you’re interested in learning more, Talley launched three videos on her Facebook page: www.facebook.com/TalleySergent.